UKIP's ruling national executive committee (NEC) has unanimously backed a vote of no confidence in party leader Henry Bolton. Mr Bolton has faced repeated calls to quit over offensive texts sent by his former girlfriend. But he has said he will defy the committee and continue as leader, as a contest would finish the party. Party members will now be given a vote on whether the former Army officer should remain in post. 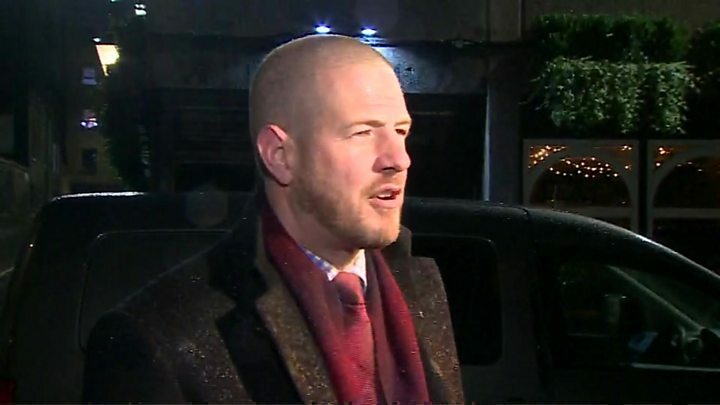 UKIP chairman Paul Oakden said Mr Bolton was "disappointed" by the NEC's decision but understood "that the party has a process to go through". "Henry was offered the opportunity to resign but he has made clear that he feels he is the right man to lead the party forward," he added, after a three-hour emergency meeting to decide his future. The committee does not have the power to remove him - that can only be done by a vote of the party's membership. Mr Bolton had earlier toured TV and radio studios, saying the committee had no right to pass "moral" judgement on his private life. He said he had ended the "romantic element" of his relationship with girlfriend Jo Marney after she sent texts saying Prince Harry's fiancee Meghan Markle would "taint" the Royal Family, leading to accusations of racism. But he said he would "support her in rebuilding her life", which he said had been "turned on its head". If the former army officer were to step down it would leave UKIP seeking its fifth leader in 18 months. Mr Bolton warned that another leadership contest could spell the end for the party, which is believed to be heavily in debt, and said calls for his resignation were part of a "coup" attempt by a rival faction in the party. "If the NEC decides to go down the road of months of further in-fighting and further negative media scrutiny by deciding to pass a vote of no confidence in me, I think that the reality is that the party is probably over," he told ITV's Peston on Sunday. He said the NEC should be focusing on ensuring the party's "survival" rather than discussing his leadership. The 53-year-old party leader, who left his wife prior to his relationship with Ms Marney, 25, became public, said: "I don't believe I have done anything wrong. "My own personal life, it's a little bit of a mess at the moment. I need to sort that out, of course." UKIP said in a statement that, after a discussion of "recent press coverage" of the leader, "the committee took the decision to hold a vote of no confidence in the leadership of Henry Bolton". It added: "The vote was carried unanimously, with the exception of the leader." Under UKIP rules, an emergency general meeting must be staged within 28 days to endorse or reject the no confidence vote. Members will be told about when and where it will be held in the next 10 days. Senior figures have called on Mr Bolton - who won the leadership of the pro-Brexit party in October after a close-fought contest - to stand down to save the party. Neil Hamilton, the party's leader in Wales, said: "He should now resign from UKIP immediately so we can get on with rebuilding the party without further distraction. "If he forces us to hold an EGM, he will only humiliate himself further." Gerard Batten, UKIP MEP for London, said Mr Bolton's position was "untenable" and that the controversy was "damaging" UKIP, and he offered to step in as interim leader. Who is new UKIP leader Henry Bolton?